The summer-to-fall garden transition proceeds in September, while garden tasks continue: planting, weeding, and collecting or ordering seeds. This month is also a good time to take stock of the garden, reflect on the season, and look ahead to changes. Native trees, shrubs, and perennials can be planted this month, providing weeks of warm soil temperatures for the plant roots to establish before soil temperatures drop. You will not see much growth above ground, but new roots developing now will provide a quick start for your plants next spring. Next summer these fall-planted gardens will grow quickly and look similar to long-established plantings. Native plants and seeds can be ordered and shipped now for fall planting. Note that regional nurseries may include species that are not native to your area. Also, in September, plants can be divided or transplanted from existing native gardens. Use the current habitat (where the plant is thriving) as a guide to choosing new locations. Delay planting seeds until after frost. This will keep grass seeds from germinating before good growing conditions return in spring. Also, many forb seeds require a cold treatment to break dormancy; our Wisconsin winter can provide this. In addition to sowing seed in prepared areas, you might plant some in flats and over-winter them outdoors in your garden. Then you will have a selection of seedlings from your seed mix to help you identify the young plants. These flats should be screened to protect them from chipmunks and voles. Settle them into the ground and lightly cover with leaf mulch for the winter. This month is a key time to find interesting fruits and seeds dispersing in your garden, especially fleshy fruits and stick-tights. 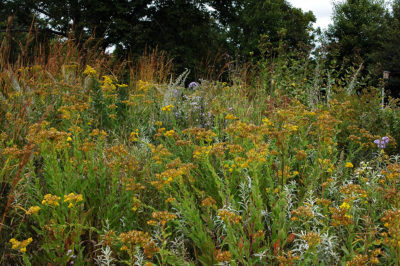 Somewhat weedy natives, such as white and yellow avens (Geum canadense and Geum aleppicum), agrimony (Agrimonia gryposepala), and stickseed (Hackelia virginica) will find you. Their hooked fruits stick to clothes and fur. When fruits and seeds are mature, collecting some (30–40 percent) will still leave seed to germinate on the site. To determine maturity, watch for splitting pods and capsules or for the earliest wind dispersed seeds on plants like asters, goldenrods, and some grasses. You can also start on next year’s weeding now, by digging rosettes of cool season mustards like pennycress (Thlaspi arvense), shepherd’s purse (Capsella bursa-pastoris) or woodland species garlic mustard (Alliaria petiolata) and Dame’s rocket (Hesperis matronalis). Removing foxtail (Setaria spp.) plants before they spread seed will limit this annual grass. September may give you time to look at your garden in a new way. Try changing your routes through the garden and your routines in it. Taking pictures of the garden may shift your focus and bring new observations. I discover things through the camera viewfinder that may go unnoticed otherwise. Using a sketchbook or easel may allow you to see and learn more about a familiar garden space. Visit another garden to inspire additions or changes in yours. Our Native Gardening Conference on September 17 offers workshops that will help you envision, plan, and care for diverse native plant gardens at home. Registration closes on September 7! Speaking of change, my least favorite late summer task is saying goodbye to our summer student gardeners and teacher and student volunteers as new school schedules begin. All summer, Ali Lorenz and Maddie Rohr worked in the garden and monitored bumble bees. This fall, Ali begins her Master’s program in social work and Maddie continues her undergraduate work in environmental and legal studies. I am so grateful for their hard work, great questions, and enthusiasm for native plant gardening and bumble bees! Come visit the native plant garden this September to see the results of a productive summer and enjoy the fall transition.